I have a large container on my patio with strawberry plants in it. This was the 2nd summer for these strawberries. Unfortunately, the plants only put out a handful of strawberries back in early June. I was very disappointed to say the least. I had stopped by a local nursery to pick their brains about the lack of yield I had this summer. The lady there told me that strawberries grown in containers don’t typically produce a lot of fruit compared to those growing in the ground. She also asked me if I had fertilized my strawberry plants last fall before winter set in. I had never heard of doing this. Why would you fertilize a plant that is about to die from the coming cold months? If this is true, when do I fertilize? Now, that the plant is still green and alive, or do I wait for it to curl up and die after winter hits? It should be noted that I leave this container outside on my patio uncovered and exposed to the snow and elements all winter long. It survived fine this way last winter and grew back really nice this past spring, so I really didn’t have to baby it at all to keep it alive. It survived! Also, what fertilizer, if any, do I use for this fall fertilization? Thanks for writing in and asking about the best way to grow strawberries in containers. Believe it or not, many people write in asking about one aspect or another of using mobile, hanging, or other smaller containers for cultivation of their strawberry plants. And, like you, many people are less-than-thrilled with their results. To help you get things going in the right direction, let me make a few comments, and I’ll then list some of the common problems people have to deal with when growing strawberries in containers. First a little bit of information about the strawberry plant itself may be in order. Amazingly, strawberry plants don’t actually die during the winter months if cared for properly (or if they live in a location where temperatures are sufficiently mild). They enter a state of dormancy where they are still living, but only just barely. This reduces the metabolic demands that are present normally to a bare minimum. The leaves die back, plant functions slow to a crawl, and they surely do look dead. But, come warmer temperatures during the late winter or spring, they burst forth again into vibrancy and verdant vivaciousness! Potted plants can even survive without any additional care in places with relatively mild winters simply by benefiting from the radiant heat that passes through house walls (if they are kept close enough). With that said, strawberries CAN be grown in containers successfully. They can even produce just as well in containers as their in-ground counterparts. However, since strawberry plants don’t typically find themselves in pots out in the wilds, the folks who put them there need to keep a few things in mind. Remembering these tips will help your plants do well. 1. Pots are small, so avoid overcrowding. 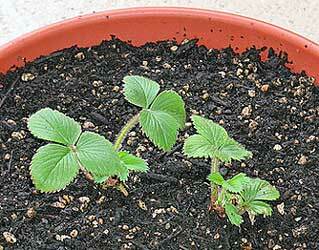 Strawberry plants are small, and they can easily fit into most pots. But, just like most other plants, they like their space and hate to be crowded. 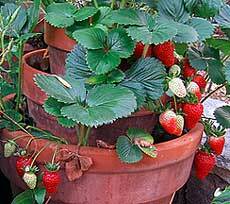 When growing strawberry plants in containers, the temptation is to let more plants root than the small area can support. To make sure you get the most out of your berry plants, be sure to let no more than 3 (or if a smaller variety, 4) plants root per square foot of soil. Since strawberry plants have relatively shallow root systems, the surface area (as long as the pot or container doesn’t taper too quickly) is sufficient to use as your calculation. If you allow too many plants to root, they will provide you with few strawberries, even if they look green and lush. Most strawberry plants put out runner plants. These plants are great if you have a garden with extra space, but they aren’t so great for pots. While they will often make a very pretty cascade from a hanging basket, they also put quite a drain on the productive capacity of your plants. Snipping the runners as soon as they are recognized will allow and encourage the plants to devote most of their energy in the direction you would like: making strawberries! 3. Growing strawberries in containers increases exposure. Strawberries are temperate by nature. That means they thrive in the temperate zones of earth above and below the equatorial tropic zones. They can’t stand tropical conditions very well without some sort of climate control. If the heat doesn’t do them in outright, the fungi and pests that do thrive in the tropics usually will. Growing strawberries in containers exposes the all-important roots of the plants to warmer temperatures than they would normally find in the ground. Without the thick and insulating properties of the ground surrounding their roots, strawberries in pots will often see their root temperature rise with the temperature of the surrounding soil. Especially if you have dark pots/containers, the root temperature is likely to rise to the point where strawberry production is affected. To mitigate this, try to shade the containers where your strawberries live. You can also put a reflective material like aluminum foil around the pots to dissipate the heat and to shade the pots as well. Also, lightly spraying the containers with a little bit of water when you water the plants can cool them as well as the water evaporates and takes some of the residual heat with it. 4. Water more often with less water. Due to the exposure mentioned in the last point, the soil in pots will often dry out more quickly than you water them. Or, to compensate for that tendency, you may water them too much and keep the soil soggy. The trick to growing strawberries in containers is to avoid both dryness and sogginess. That is accomplished by watering with less water several times a day in the heat of the summer. The soil should stay just-damp, never dry. Also, make sure that your chosen container will drain adequately. If the soil stays soggy, even beneath the surface, deadly microbes can set up shop and deal death to your once-happy plants. 5. Container strawberries need attention after harvest. Unbeknownst to most, the life cycle of a strawberry plant is somewhat complex. Strawberries themselves don’t actually originate in the springtime. They started their lives in the fall of the previous year. After producing a (hopefully) bountiful harvest for you, the humble strawberry plants don’t check into the equivalent of a plant Hilton for the rest of the summer to enjoy life as a container plant. No, indeed. They get busy growing and reproducing themselves via runners. Not only that, but by the beginning of fall, the little strawberry plants have begun forming the perennating buds within their crowns that will turn into next year’s flowers. The flowers turn into strawberries subsequently. So, failure to pay attention to the well-being of your container strawberries after they give you strawberries will come back to bite you in the long run. They need tender loving care through the fall. 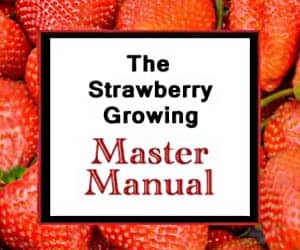 Specifically, to provide the nutrients your plants need to maximize perennating bud formation (which you will then harvest as strawberries the next spring), apply an appropriate fertilizer (10-10-10 conventional, or an equivalent organic fertilizer) in August at a rate of approximately 1/3 of an ounce per square foot. 6. Provide extra insulation for strawberries in containers. Just as heat seeps in during the blazing summer months, winter sends forth its icy fingers more readily into above-ground containers as well. If your winters are mild, there is little to worry about. If the temperatures stay in the twenties, or just dip into the upper teens for a short period, your plants will likely come out of the winter unscathed. If the temperatures drop out of the low twenties and stay there for a while, your plants can freeze straight through. That will surely kill them. So, if the forecast calls for cold, wrap your sleeping strawberries snugly with some insulating material and/or put them in the garage to provide them some shelter from the harsh bleakness of winter. If you follow the general principles for growing strawberries as described here, and you pay special attention to the tips and cautions mentioned above on this page, there is no reason your container strawberries can’t perform just as well as in-ground strawberry plants. Just keep an eye on the little fellows a little more than you would the strawberries out in a garden. And, of course, good luck! Hey, just planted bare rooted Chandler strawberries in a Sta Green elevated tower planter. I live in Texas zone 9a and understand treating the plants as annual June bearing plants. It was suggested to leave an open space below each plant so that runners from plants above could root and produce more strawberry plants. I’m confused? Will the runners have time to root and produce strawberries by June? Just thinking I may be wasting a lot of open space that could be used to produce more strawberries. I am growing June bearing berries in terracotta pots. Should the plants be pruned back before winter or do you just leave them as is? Hello, can I grow an ever baring variety in container inside my house all year. I would like to start from seed(not sure which would be best)please advise Would the plant keep its leaves all year or like outside loose all in winter ? Mr. Straberry…I have planted two plants per root bag containers in my greenhouse. They seemed to be doing well until the leaves developed a coppery stain. Any ideas on how to treat them. Should I removed them from the bags and plant them in the garden. They do have a few berries starting. Thanks. If it’s a reddish coppery colour, starting in the tips of the leaves and working in, it could be nitrogen deficiency, which can be worsened by over or under irrigating. Stick some N rich fertiliser on, and check your soil moisture levels? Sounds like it might be a heat issue. Heat stress will make them wilt like that, especially if it begins on the edges/tips of the leaves.